Monkeys make a great theme for birthdays, baby showers and weddings. 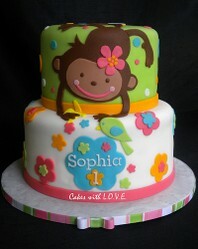 This page features an assortment of Monkey cake and cupcake ideas & supplies. Hosting a Monkey theme party? If so, you will find everything you need here to create a delicious and memorable party treat for your celebration. Some of the Monkey cake and cupcake supplies featured on the page include edible cake toppers, cake pans, cake kits, cupcake picks, paper cupcake toppers, wedding cake toppers, fondant accents and more. Please note: I have received permission to display the Monkey cake and cupcake photos you see on this page. These photos are the property of their owners and must not be copied without consent. Use a specialty cake pan or cake kit to create a fun party treat! 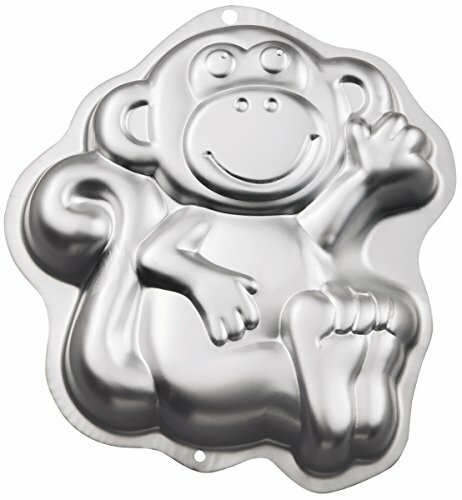 Wilton released the Monkey cake pan #2105-1023 in 2008. This specialty cake pan comes with complete baking and decorating instructions. The Monkey cake pictured below is a sample of how the finished cake will look. There is also a Monkey cake kit available that is super adorable. The cake kit comes with a plastic Monkey head, tail, hand holding banana and feet. This decoration would look terrific on a cupcake cake. Simply bake your cupcakes, frost with chocolate icing and then arrange on a 9 X 13 cake board in a pattern similar to the one pictured. Add the plastic decorations and your monkey will come to life! There are two very cute Monkey cupcake decorating items available for your party treats. The first is a palm tree cupcake pick and small toy Monkey assortment. 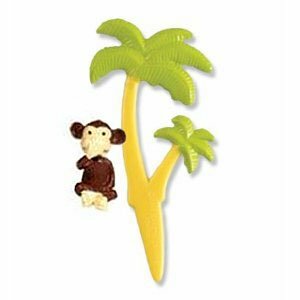 Each order comes with 10 palm tree picks measuring approximately 2" and 10 small monkey figures which measure about 1". The monkeys all have a different looks including holding their ears, doing somersaults & headstands, covering their eyes and sticking their tongues out. These adorable monkeys will be the hit of the party! The other cupcake decoration is a Monkeyin' Around cupcake topper. These cupcake picks measure 2 1/2" tall and are sold in packs of 12 toppers. A simple way to make an awesome cake! I love edible cake toppers! I have used them a few times in the past and am always pleased with the results. If you are not an advanced cake decorator than an edible cake image is a simple way to create a masterpiece that will wow your party guests. The monkey cake image featured here is from Lucks. This cake topper fits a 8" round cake, but it can also be used on a sheet cake like you see here. You can add some palm trees or other decorations on the sides to fill in the white space. If you are hosting a Mod Monkey party, there is a large selection of personalized Mod Monkey and Monkey Love cake images available on Ebay. These monkey cake decorations can be used for round cakes, sheet cakes, cupcakes and even cookies. Features an adorable, messy little Monkey! Embellish your monkey cake with candy or fondant bananas. Bananas would make a great addition to your monkey cake or cupcakes. You can decorate your party treats with candy bananas or fondant bananas. 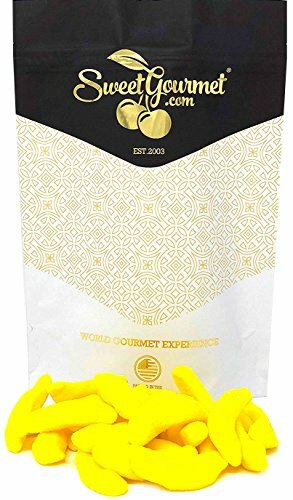 The candy bananas available include Banana Heads and Sugar Bananas. 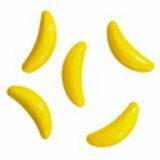 To make fondant bananas for your cake, purchase yellow fondant and then gently roll the fondant into a banana shape. What monkey doesn't love a delicious banana? Made using the Fingeroos monkey cake kit featured below. How sweet is the little monkey pictured below? The Fingeroos Monkey cake kit is offered by Decopac. Each monkey cake kit includes eyes, feet, hands and ears and is made to fit on a 4" dome cake. You can use the Wilton Mini Wonder Mold to make your cakes and then decorate. 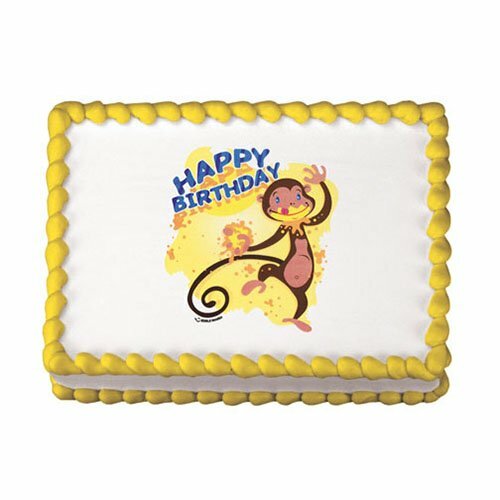 The mini monkey cake can be placed on top of a larger sheet cake or placed on a round cake plate and surrounded with cupcakes. Another option would be to give each child their own personal cake. They will love that! Use this woodgrain impression mat to create a barrel design on your cake. Easy to apply to your home baked party cupcakes. Cupcake wrappers would look wonderful on your party cupcakes. There are many Monkey themed cupcake wrappers to choose from including Mod Monkey, 1st, 2nd & 3rd birthday Monkey, Space Monkey, Island Monkey, Sock Monkey and more. Simply bake your cupcakes and then attach the cupcake wrapper. Make your own cupcake toppers. Paper cupcake toppers are very simple to assemble and will give your party cupcakes a fun, festive look! 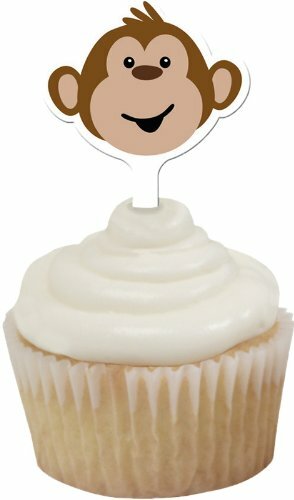 To create your paper cupcake toppers, you can use a Monkey sticker such as the one pictured here. There are many different styles available. For more instructions, please visit my Cupcake Topper page. You can also purchase already made monkey cupcake toppers on Ebay via the link below. A monkey face is a fairly simple to design to create using fondant. To add a bit of fun to your fondant monkeys you can make each face feature a different expression as you see in the picture here. Fondant colors needed for your monkey designs include ivory, brown and yellow if you are adding a banana. Monkeys are so adorable that many brides and grooms are choosing a Monkey theme wedding. If you are having a Monkey theme wedding, there are many custom made monkey cake toppers on the market to choose from. These wedding cake toppers are hand sculpted and one of a kind. Some of the designs include Pucker Up!, Island Monkeys, Monkey Love and Paradise Monkey. These monkeys would look super cute on your wedding cake! Thanks For Swinging By My Monkey Cakes Page! I really like these monkey cakes. The monkey-shaped pan is a great idea. Adding it to my Fun Gifts for Kids board. The Sophia Birthday cake is my favorite. So whimsical and cute! Monkey cakes look like great fun - love the ones made from cupcakes. Great idea. It was tough to choose but I think my favorite was the monkey love cake. I love these monkey birthday cakes, cupcakes and ideas. My daughters have long loved monkeys they have so many with the bright colors like on the cakes, love the first birthday cake. I love these! The cupcakes are especially clever. Sweet butterflies make a great theme for a birthday parties, baby showers, bridal showers and weddings. This page features butterfly cake and cupcake supplies for your celebration. Welcome to the Hello Kitty gift shop! Whether you are decorating your home, looking for beauty supplies or hosting a party, this page features many unique Hello Kitty items.